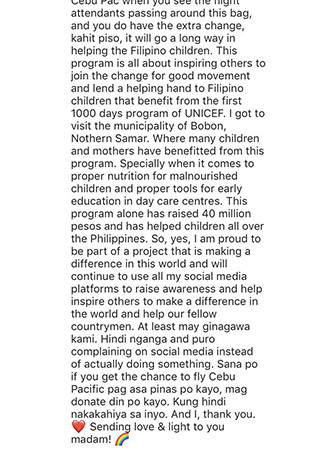 Anne Curtis is a very busy woman, but not too busy to take the time and work with her favorite charities. 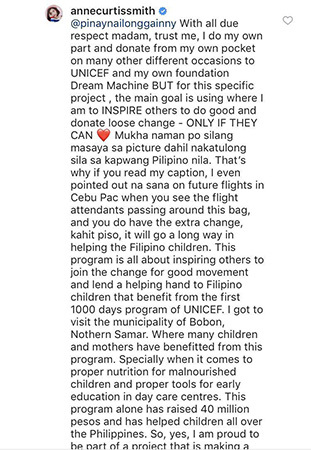 She most recently helped out with UNICEF Philippines and Cebu Pacific's Change for Good program. 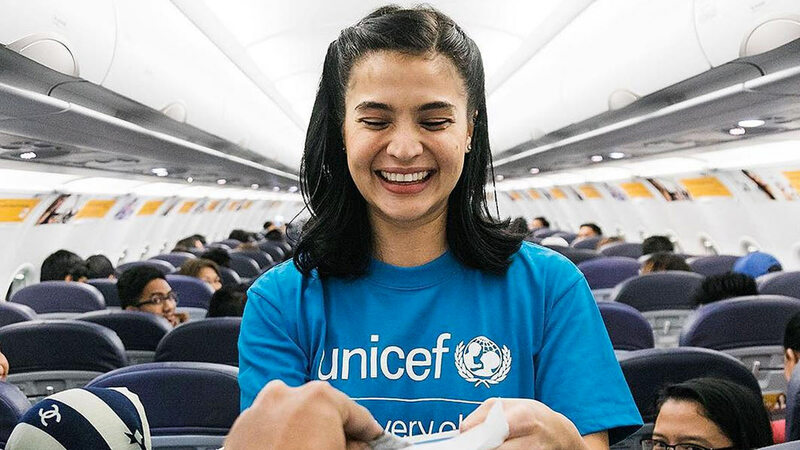 While on a flight from Cagayan De Oro, the actress went around the plane to ask passengers for change to be donated to UNICEF's 1,000 Days program. "To all CEBU PAC passengers, next time you're on a flight and the lovely F.A. 's come around with this bag know that you are helping children," wrote Anne on her Instagram post. "Your loose change goes a looooooong way." Despite the good vibes and inspiration Anne was trying to share with her post, one netizen questioned why she was collecting money from "low-income citizens." "How about Anne just give her own money to help UNICEF?" asked Instagram user @pinaynailonggainny. "Can't help but think that these acts of 'kindness' that celebrities do is all for publicity." Anne took it upon herself to courteously respond to the commenter saying, "With all due respect madam, trust me, I do my own part and donate from my own pocket on many other different occasions to UNICEF and my own foundation Dream Machine." She went on to clarify her role in UNICEF's Change for Good program: "For this specific project, the main goal is using where I am to INSPIRE others to do good and donate loose change—ONLY IF THEY CAN. Mukha naman po silang masaya sa picture dahil nakatulong sila sa kapwang Pilipino nila. That's why if you read my caption, I even pointed out na sana on future flights in Cebu Pac when you see the flight attendants passing around this bag, and you do have the extra change, kahit piso, it will go a long way in helping the Filipino children. This program is all about inspiring others to join the change for good movement and lend a helping hand to Filipino children that benefit from the first 1,000 days program of UNICEF." Anne went on to talk more about her work with UNICEF and shared her experience of witnessing the positive effects of this program first hand: "I got to visit the municipality of Bobon, Nothern Samar, where many children and mothers have benefitted from this program. [Especially] when it comes to proper nutrition for malnourished children and proper tools for early education in daycare centers. This program alone has raised 40 million pesos and has helped children all over the Philippines. "So, yes, I am proud to be part of a project that is making a difference in this world and will continue to use all my social media platforms to raise awareness and help inspire others to make a difference in the world and help our fellow countrymen."